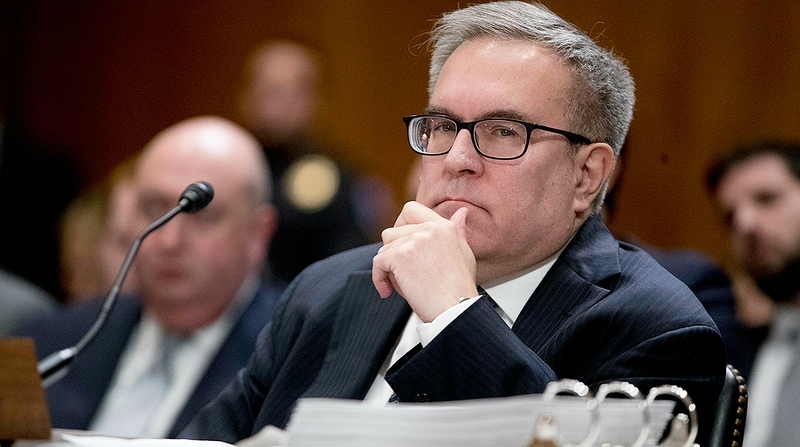 Characterizations of Andrew Wheeler’s tenure as acting administrator of the U.S. Environmental Protection Agency fell mostly along party lines during his confirmation hearing to lead the agency. Democratic members of a Senate panel criticized his efforts to roll back Obama-era regulations for fuel efficiency and carbon emissions from power plants, while Republican members praised the nominee for his leadership on environmental efforts. Wheeler, nominated by President Donald Trump, testified before the Senate Committee on Environment and Public Works for nearly three hours on Jan. 16. He has been serving as the agency’s acting administrator since July. He was confirmed as the agency’ deputy administrator in April, but was elevated to acting leader after former EPA Administrator Scott Pruitt left the agency under a cloud of ethics violation investigations. The committee will vote at a future hearing on whether to pass Wheeler’s nomination on for full Senate vote. One of the strongest criticisms of Wheeler at the hearing came from Sen. Tom Carper (D-Del. ), who urged the nominee to act swiftly to address climate change and to support the policies that strengthen protections for the environment and public health. Sen. Cory Booker (D-N.J.) said Wheeler has not moved quickly to address a dire National Climate Assessment in November by 13 federal agencies, including EPA, that called for quick action by government officials in reducing greenhouse gas emissions. “Why are you pulling back on regulations that deal with what our climate scientists say that we need to do to reduce greenhouse gas emissions?” Booker asked. However, Sen. John Barrasso (R-Wyo. ), chairman of the EPW committee, lauded Wheeler for his leadership. Sen. Dan Sullivan (R-Alaska) pointed out that Wheeler worked four years as an EPA career employee and 14 years as a staff director and chief counsel for the EPW committee. Democratic senators noted, however, that Wheeler’s experience also included four years working as a lobbyist for the coal industry. There was no discussion at the hearing about current considerations to repeal an Obama administration rule to limit the production of glider trucks. But in his introductory remarks Wheeler mentioned a clean truck program the agency announced late last year. “On the air side, we have launched common-sense reforms such as the Cleaner Trucks Initiative,” Wheeler told the committee. “By working closely with states and the private sector we will reduce NOx emissions from heavy-duty trucks, which is not required by statute or court order but makes sense to do,” he added, referring to nitrogen oxide. Sen. Bernie Sanders (I-Vt.) pressed Wheeler on the president’s characterization of climate change as a hoax.